The DSC Prize for South Asian Literature has gone to Jayant Kaikini and his translator Tejaswini Niranjana for No Presents Please (Harper Perennial). Kaikini and Niranjana received the $25,000 prize, which they will share, at the Tata Steel Kolkata Literary Meet in Kolkata, India. No Presents Please, originally written in Kannada, is a portrait of the city of Mumbai. 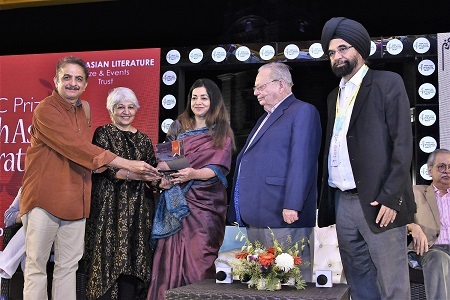 Jury chair Rudrangshu Mukherjee said: "The jury was deeply impressed by the quiet voice of the author through which he presented vignettes of life in Mumbai and made the city the protagonist of a coherent narrative. The Mumbai that came across through the pen of Kaikini was the city of ordinary people who inhabit the bustling metropolis. It is a view from the margins and all the more poignant because of it." Also shortlisted were Kamila Shamsie for Home Fire (Riverhead Books US; Bloomsbury UK); Manu Joseph for Miss Laila Armed and Dangerous (4th Estate; HarperCollins, India); Mohsin Hamid for Exit West (Riverhead US; Hamish Hamilton/Penguin UK); Neel Mukherjee for A State Of Freedom (Chatto/Vintage UK; Hamish Hamilton India); and Sujit Saraf for Harilal & Sons (Speaking Tiger, India). In addition to Mukherjee, the judges were author Nandana Sen; Claire Armitstead of the Guardian; author Tissa Jayatilaka; and Firdous Azim, professor of English at BRAC University, Bangladesh.